Mosaic floor tiles bring out the beauty and freshness of nature indoors. The beauty of mosaic is in the way it can be created depending on your creativity and imagination. Small pieces of materials (like stones or glass) can turn into interior design or decorative art masterpieces. If you want something unique for your bathroom, you may want to check the following ideas that incorporate mosaic tile flooring. Mosaic floor tiles are best for unique bathroom designs. For this particular bathroom, arabascato marble is used for the flooring. 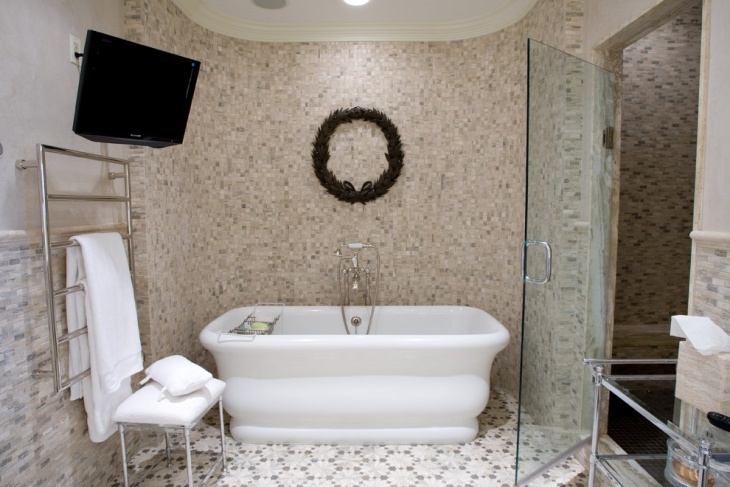 This floor design provides a nice base for the classic white cast-iron rolled rim bathtub used. To add a more traditional touch, a wall-mounted telephone shower/faucet set and white shower curtains are used. White is also used for the wall – white standard subway tiles. Designing a bathroom for girls is not that hard. Basically, you just need to consider the main color, which could be the girl’s favorite color. 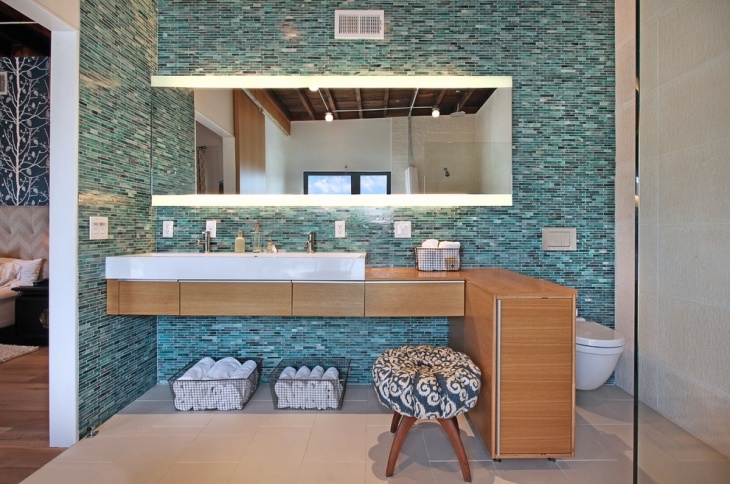 This girl bathroom design idea used green as the main color. 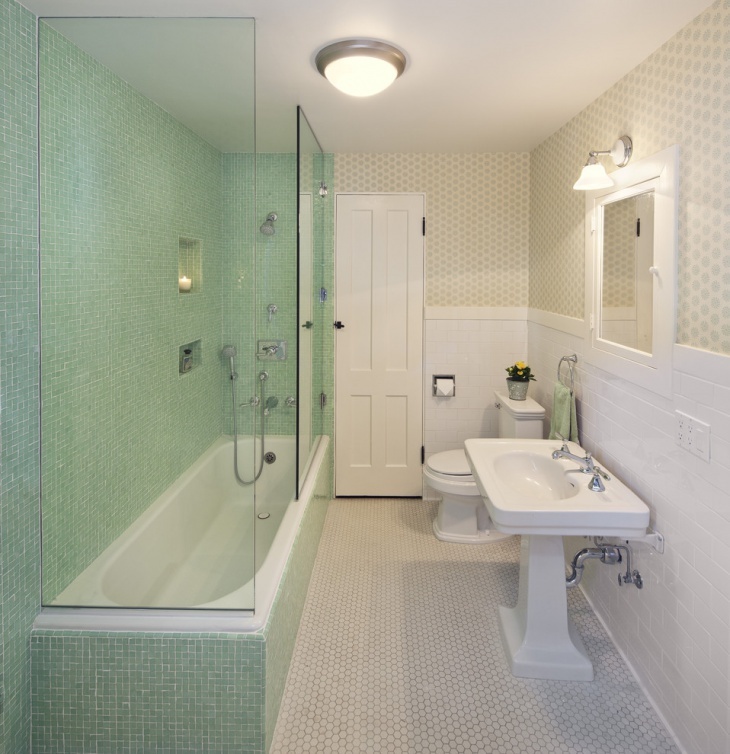 Although most part of the room is in white or beige color, the green mosaic glass tiles used for the shower area and around the tub provides the room with a touch of feminine appeal. 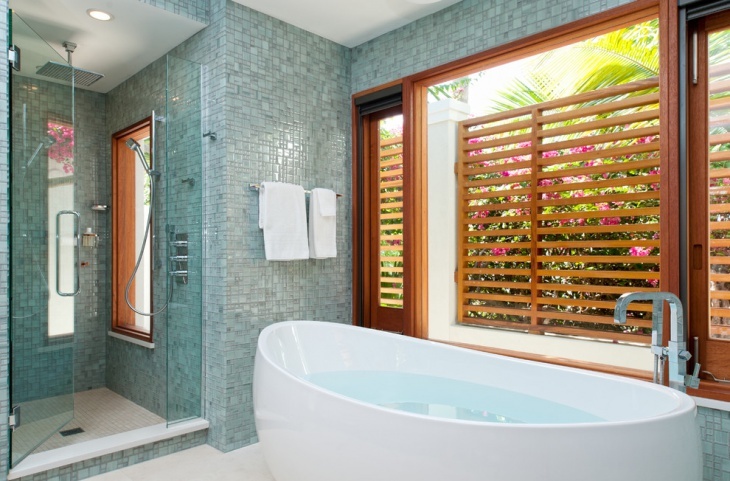 This bathroom does not just have the modern appeal, but it also has that unique idea of indoor and outdoor transition. The eclectic oval free-standing tub is set at a wall with a wooden slat screen window that offers the refreshing view of a garden. 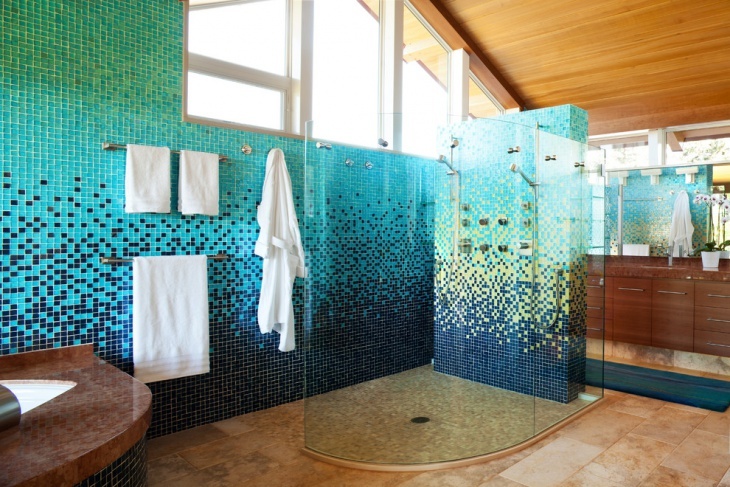 The blue glass tiles used for the shower area look really great with the tall glass window – again the garden provides the much-needed privacy and division between the bathroom and the outside world. 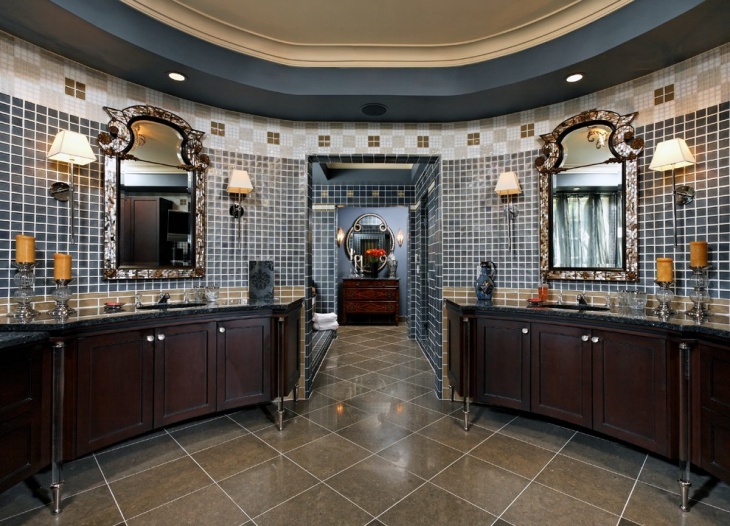 This luxurious master bathroom defines vintage design at its best. The use of a chandelier is a clear indication of the classic look that needs to be achieved. 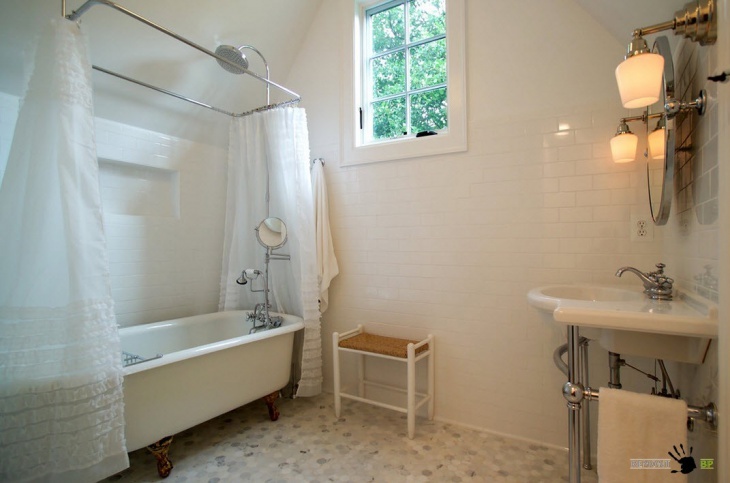 The tub area has a bathroom fireplace that provides additional vintage appeal. The mosaic tile floor adds a touch of creativity into the setup. 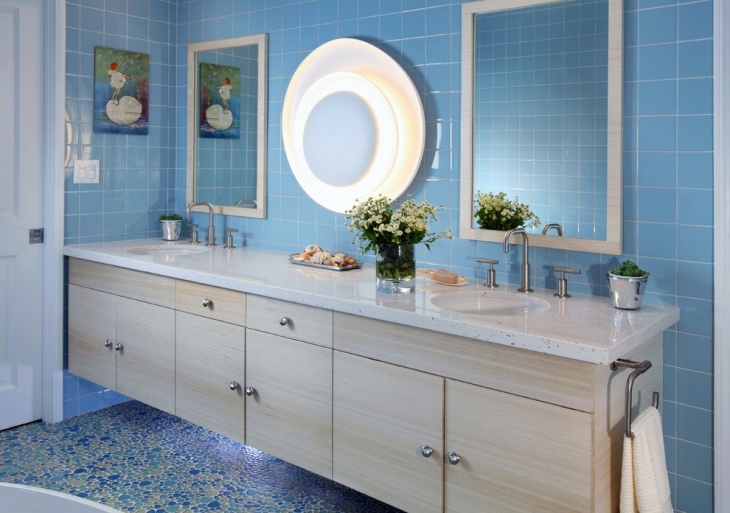 A white bathroom with blue mosaic tile floor is definitely a great idea. Add a tall window with views of the trees outside in the middle of one wall, and you will surely get a very unique and relaxing bathroom experience. Wooden cabinets are good additions to unique bathroom ideas. The rich dark brown color of the cabinets is nicely in contrast with light colored sink top. A similar look is done with the floor with the use of dark floor tile framed by a lighter mosaic tile design. 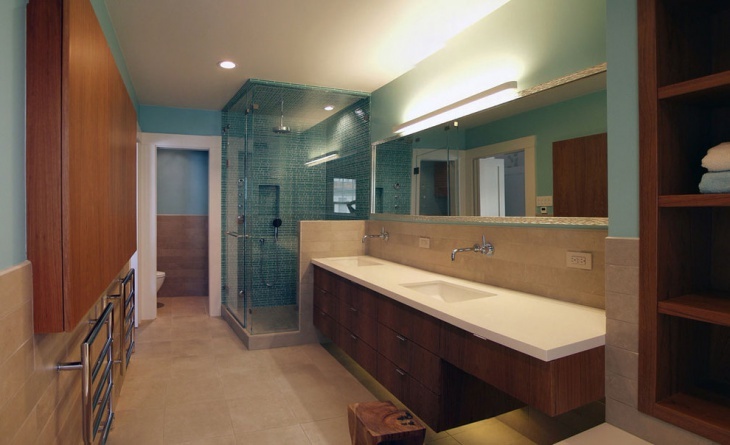 The tub and shower area are separated by one glass wall, creating a nice integration between the two spaces. Wooden tub, wooden stools, and wooden side table – these are the things that make this bathroom totally unique and appealing. Though a wooden tub can be considered vintage, when incorporated with the right style, design, and features, it can turn a space into one beautiful modern bathroom. 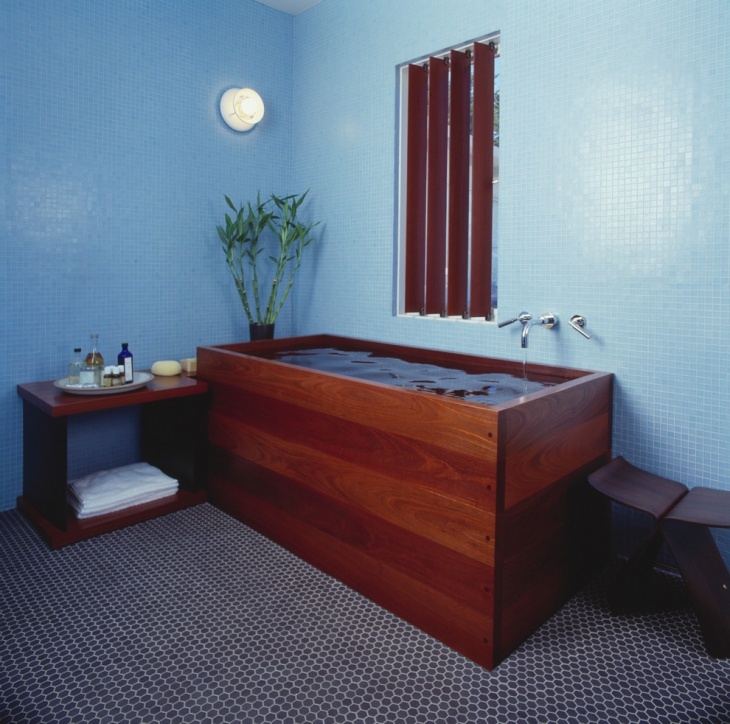 The unglazed dark (almost black) mosaic tile floor provides a nice base for the tub, while the light blue wall is responsible for a serene backdrop. 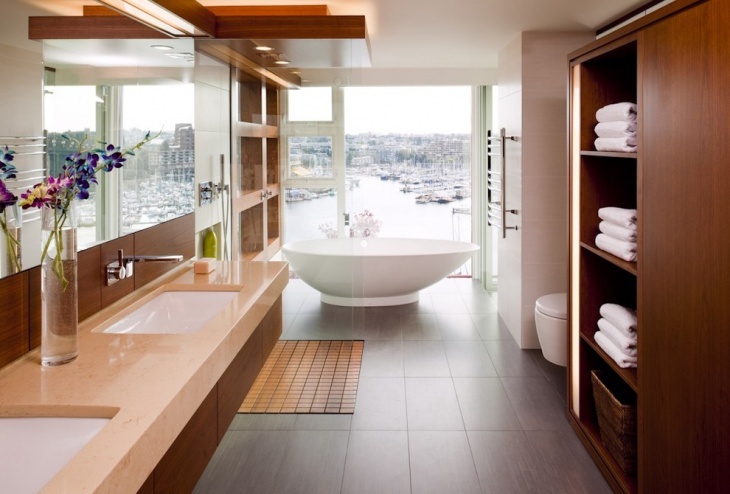 For a simple bathroom idea, you may want to take a few ideas from this bathroom. 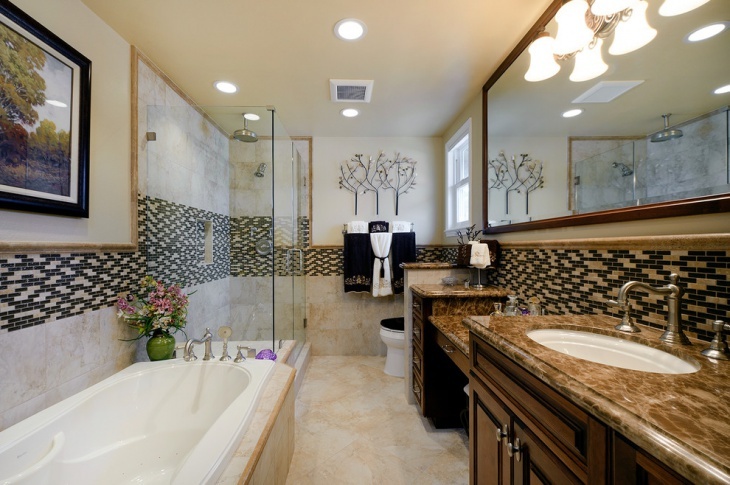 This bathroom is simply beautiful in white – walls, sink, tub, toilet, and cabinets. The bordered mosaic tile floor provides the break on the whiteness of the setup. This is one genuine trendy bathroom, with the mosaic tile and glass shower enclosure providing both unity and separation depending on the occupants’ moods. 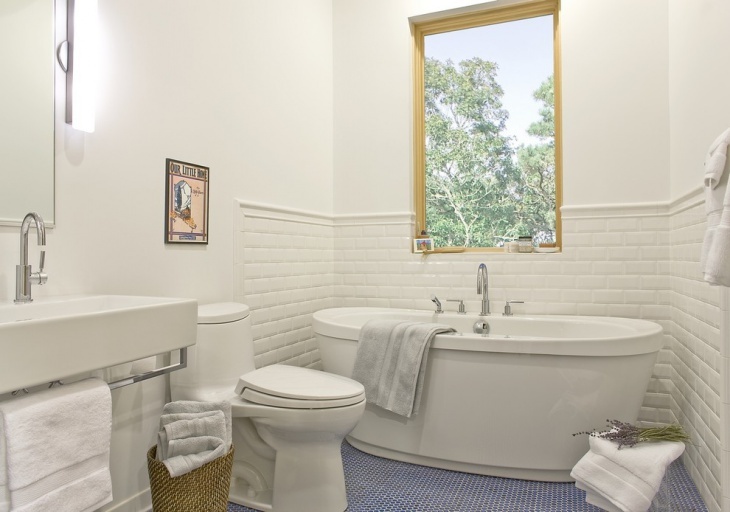 This is a perfect bathroom for couples who like having privacy from or access to each other. 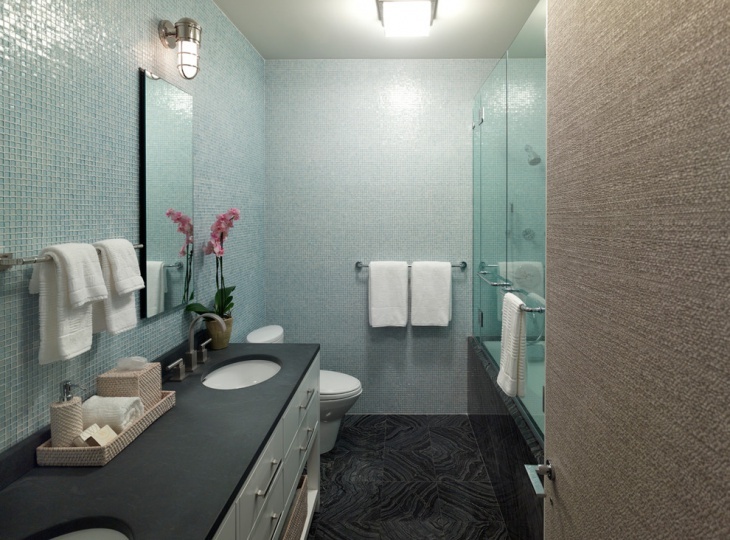 The vintage look for this bathroom is achieved with the use of backsplash that is quite edgy. 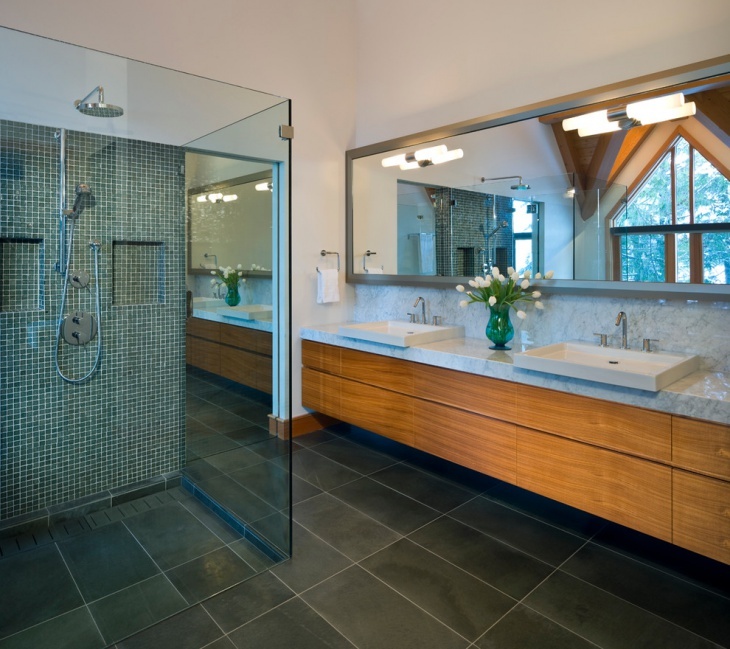 The glass enclosure for the shower area provides the division from the whirlpool, while the long vanity is set perfectly over the long sink counter connected with a makeup desk provide functionality in one set up.